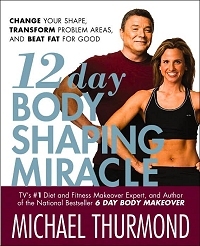 Fitness Expert, Michael Thurmond claims you can transform your body in only 12 days if you follow the steps outlined in his new book 12-Day Body Shaping Miracle ($23.95). How? Because of his blueprint questionnaire that lets you identify your body type, then customize a plan that pinpoints your problem areas. He even takes into account special medical conditions such as diabetes and high blood pressure when designing a system for you.